Have you ever heard of cake croutons? Perhaps you have even had them, or made them yourself. Well, the other day I noticed that I had a box of patriotic confetti cake mix. I knew I should make something with it this weekend or else it would be sitting on the shelf for a long time. 1. Bake the cake (9x13) and let it cool completely. 2. Slice it in half down the center. 3. Slice each half in half, horizontally. 4. Use a serrated knife and slice long strips in one direction and then the other, to end up with cubes. 5. Place all the cubes on baking sheets in a single layer. 6. Bake at 200 degrees for about 4 hours (I alternated the pans on top/bottom rack every hour), or until nice and crunchy. You end up with golden, sweet, crunchy goodness! The possibilities for cake croutons are endless! You can make them any cake flavor that you prefer (from scratch or from a box)...chocolate, red velvet, vanilla, banana, peanut butter. I'm sure you get the picture:) And what can you do with them? Use them to add a bit of sweet crunchiness to pudding, yogurt or hot chocolate. Throw a handful on a salad or dip them into a chocolate fondue. Add a bit of pizazz to a shake by topping it with cake croutons. I topped some ice cream with them and the crunchy contrast of the croutons to the creamy, melty ice cream was soooo good! Don't they look festive? Perfect for any occasion! I actually think my favorite way to eat them may be to snack on them plain, right out of my hand! But be careful, they're pretty addictive! Love the the Sundae! Happy 4th of July, I might be able to catch some fireworks here, they don't celebrate Independence day, but I'll do my best to. What a lovely idea! 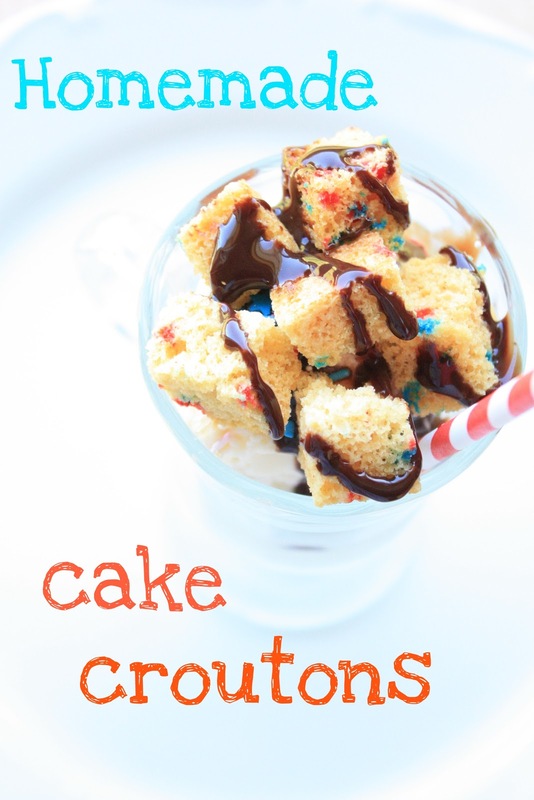 Cake croutons sound like a great addition to ice cream :)! How much fun are these?? What a clever way to make cake just a little bit different. I would love a nice big sundae right now with some of those cake croutons on top. Yum! Love this... definitely going to have to try it! Sounds delicious and very festive! :) Wish you and your family a wonderful 4th of July weekend! No, I've never heard of cake croutons...until this post. They certainly do look like fun to make and as you say, the uses for them are great and varied! Everyone of your recipes are so unique, I just love them all. This is so wonderful and unique. I can't wait to try these. I love the idea! Thanks for a great post! I love this innovative idea! You are a genius! Let's sprinkle these on my ice cream tonight, shall we? ;-)What a cool idea Sue. Congrats on being the 6th time grandmother! What a blessing! What a great idea Sue! I love all the different ways you could use these. What a pretty and great ice cream topper! We would go crazy over these. I need to try them. You always have the most amazing ideas! I could live at your house! I have never seen this before, but they look delicious! Thanks for stopping by my blog, Let me know if you give the cake-pops a try!